I've always had an affinity towards handwritten words. I esp love hand-written letters. It is personal. It is finite. It is unique. There is a distinct romance there that really moves & captivates me. By forgoing the ease of more modern means, it really communicates the heart of the person for actually arching uncomfortably over a table & torturing their hands in creation of the letter. I feel as if someone is giving a small amount of his/her life to me on a piece of paper. I believe that a deep connection via letters would really benefit my students & motivate them to learn the English language. Last year, I played around with this idea by connecting my Form 1 students with a class of average-proficiency Primary 6 pupils in a SJK(T) Primary School in KL through their English teacher. This year, I connected the same class (now in Form 2) with a class of high-proficiency Form 4 students in SMK Puteri Titiwangsa, KL, I taught during my practical. This time it was through a student rep & not a teacher. 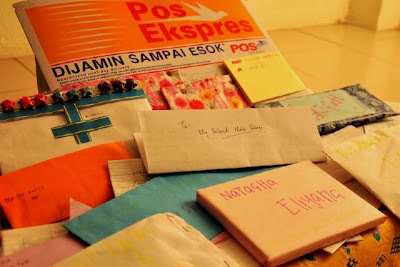 My students really enjoyed writing, reading & esp receiving those letters. They would always ask me when the new batch of letters would arrive & watch with glee every time I opened a package. They'd give their pen-pals simple gifts like cute pens, key-chains & handicraft. I believe they had a very meaningful experience. 1. Some pen-pals did not reply or did so half-heartedly. Without the imposition of a teacher, some of the pen-pals did not bother to reply or write a good reply. Several of my students would often get extremely short replies informing them that their pen-pals were busy. Some would not get replies at all! Are these KL students so caught up in their own worlds that they do not have just 1 hour to spare on an extremely meaningful letter to a less-fortunate child? Next time I do this, I must involve a teacher. 2. Replies were very late. I was able to force my students to reply within a week of receiving replies. However, the replies would only be received after 2 or more months. Imagine the wait of my students & the lost time. Sometimes I told my students to write letters even when there was no reply. Again, a teacher would increase the frequency of the letters. 3. Students copied/adapted from each other. As should be expected from weaker students, some of them adapted the work of other students which was fine by me. However, one student copied an exact letter of a classmate TWICE! I made him redo both letters. The teacher must read students' work to avoid such instances as well as to avoid any inappropriate content. I think this pen-pal idea was a resounding success. My students enjoyed it & it got them to use the target language in a meaningful manner. Some of the pen-pals (those who really put their hearts into their letters) expressed their delight too. I shall do this again next year with a school closer to mine. I'm thinking SMK St. Elizabeth, Sibu, or one of the top schools in Miri. Any teachers want to offer their classes? Anyone have a suggestion for improvement? Stephanie Khor (Student Rep), SinYan, Violacea, Fatin Nadhirah, Natasha Eliyana, TzeYen, JiaYi, XinRo, JoeLynn, ManDee, SukKei, KarKee, Angela Tan, XingYi, Evelyn Lee, Faten Amira, Hazatul, EeMing, ZiShin, Neng Daris, Nor Maslina, Norasfarizan, Nur Hazimah, Nurizani Edora, Razrina Nazira, Shabrina, Syafiqah Rosli & Syarifah Jamiamirah.